Barb Rumer, Clerk of Ministry & Counsel. Barb says, "Growing up as a pastor&#39;s child, I lived in four different communities, but I call Marion, Indiana, my hometown since I lived most of my childhood years there and graduated from Marion High School. I graduated from Ball State with bachelor and master';s degrees in business with a minor in library science, and I also earned a endorsement in computer education. I taught in Indiana public schools for 31 years before retiring as Business Department chair and computer technology teacher at Carmel High School. My husband and I have lived in Hamilton Country for the last 44 years, but we've always found Quaker Meetings wherever we have lived. I currently serve Noblesville Friends as Clerk of Ministry and Counsel and am Recording Clerk of the Monthly Meeting. I also serve on the Christian Ministries and Evangelism Board for Western Yearly Meeting. Several things have drawn me to Friends (Quakers) especially the belief that there is that of God in every person. It has always been helpful to think of God in each person even when I sometimes don't agree with what a person does or says. Also I've been drawn to Friends because of concerns for the needs of people all over the world and the peaceful approach to problems that Friends exhibit. I've enjoyed knowing about the huge influence of Quakers on the early years in this country's development." Ruth Coverdale, Office Management. Ruth says, "Hi, I'm Ruth Coverdale and I love doing the bulletins and newsletters. I live on an Angus cattle farm near Elwood with my husband of 50 plus years and assorted cats. Since I love reading and the outdoors, what could be nicer than reading on my patio all summer?! My ties to Quakerism go back several generations; I especially like how women were considered equal from the beginning. I enjoy reading Quaker history and all the wonderful things they accomplished in the past and hope we Quakers today can be used of God to make a difference in our time." Katherine Murray, Pastor. 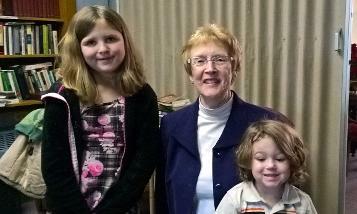 A 2008 graduate of Earlham School of Religion, Katherine is a recorded Friends pastor with Western Yearly Meeting, and she also serves Hancock Regional Hospice (Greenfield, Indiana) as a hospice chaplain and bereavement coordinator. Katherine says, "It is such a joy to serve Friends here at Noblesville Friends! This is a very loving and spirit-led meeting, and we feel spirit moving among us in new ways. I found Friends for the first time 30 years ago and knew right away that the writings of early Friends, the testimonies (simplicity, peace, integrity, community, equality, and sustainability), the leading of the inward Christ, and "that of God in everyone" speak the language of faith at the center of my heart. I hope you'll consider joining us some Sunday soon. We can feel the warming spirit of Love in this place." You can reach Katherine at noblesvl.friends.kmurray@gmail.com or follow our meeting's Twitter feed @noblesvlfriends. [April 2, 2018] Pastors past and present. 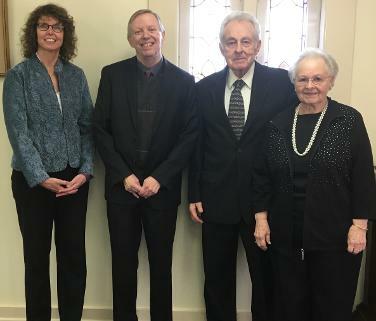 From right: Esther and Bill Griggs, David Adams, and Katherine Murray. [December 7, 2017] Pastors past and present. 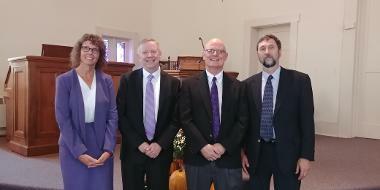 From right: Worth Hartman, Rick Schoeff, David Adams, and Katherine Murray. Some very special office helpers at Noblesville First Friends.